Discover the best of Miami on this 4-hour sightseeing tour around the city. 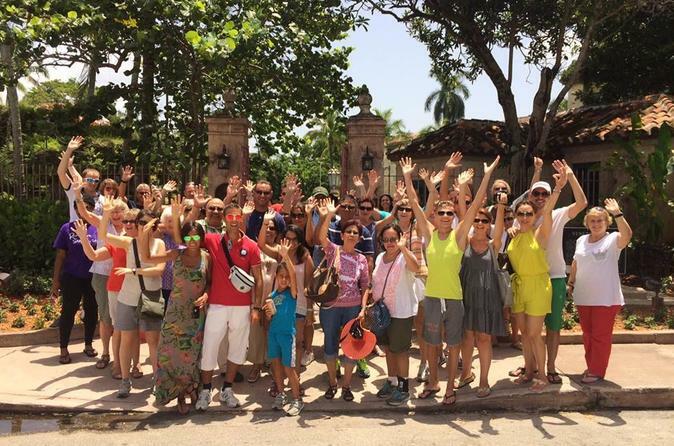 An experienced local guide will introduce you to the cultural sights, sounds, and tastes that make this city fabulous. Explore the iconic Art Deco District in Miami Beach, visit the Wynwood Walls, and enjoy a delicious Cuban-American lunch with ice cream & coffee in Little Havana. This is a one-of-a-kind experience! Absolutely no other company offers this experience with the activities included, as well as a dedicated tour guide and a professional driver. As you can already see, this is not an ordinary tour. MIAMI TO THE MAX! is a chance to have your curiosity about Miami - and your taste buds - totally satisfied. The day starts with a rock'n roll bus ride around SOUTH BEACH. Then we take a beach walk and get some exercise in the Art Deco District. After that, we cruise over to WYNWOOD and learn about 9 different types of Street Art. By now we're starting to get hungry so we drive over to a famous restaurant and enjoy a delicious Cuban-American lunch. The last stop, we hop off in LITTLE HAVANA for ice cream and a culture lesson at the Latin street fair around Domino Park. MIAMI TO THE MAX! is an absolute must. You'll meet nice people and enjoy good stories, music, food, exercise, and breathtaking scenery. We'll take you back to your hotel at the end of the tour.